Breakfast has never been the same since John Kellogg began making breakfast cereals in the 1800s. You only have to walk down the cereal isle of any grocery store to see how popular dry cereals have become over the last century. Although it is not practical or possible for us to make most of the commercial brands of cereals, the one thing we can do at home is to make our own Homemade Granola. Homemade Granola is simply a mixture of rolled oats, nuts, seeds, and spices that are mixed with oil (or melted butter) and maple syrup and then baked until golden brown. The result is a wonderfully crisp textured cereal with just the right amount of sweetness. You can eat this as you would any other dry cereal, with cold milk, or it is also great as a snack food. There are many ways to add extra flavor to your granola. For one thing, if you want it a little sweeter, add about 1/4 cup (50 grams) of white or brown sugar to the mixture before it is baked. Or you can add some citrus zest (lemon or orange) to the mixture, again, before it is baked. Then dried fruits (like cranberries, cherries, pineapple, currants, raisins, dates, figs, and apricots) or even chocolate chips can be stirred into the baked and cooled granola. Homemade granola will keep for several months if stored in an airtight container in the refrigerator. If you look at this homemade granola recipe, I have recommended using pure maple syrup that is labeled Grade A Dark Amber. This syrup is made later in the season so it has a darker amber color with a stronger maple flavor. Also, if adding dried fruits to the baked and cooled granola, there are a few things to keep in mind when buying dried fruits. First, try to buy in bulk from a grocery store or natural food store that has a high turnover. Not only will the fruit be fresher, but you can see, smell, feel, and often taste the fruit to make sure it is fresh and of high quality. Pre-packaged fruit can also be excellent but it is harder to tell the quality of the fruit through the plastic bag. Make sure to check the expiration date on the bag. Always look for dried fruit that is plump, moist, and has good color. Never buy fruit that is dried out or moldy. There is a debate about whether to buy 'sulphured' or 'unsulphured' dried fruits. Some like to buy 'sulphured' which means that it has been treated with a sulphur dioxide solution. This preserves the fruit's bright color and makes the fruit very soft and moist. The downside is that some people can taste the preservative while others are allergic. Of course, 'unsulphured' means it has not been treated before it is dried and some say the flavor of untreated dried fruits is far superior. The downside is that the fruit's color may be slightly faded looking, especially dried fruits (like apples, pears, and bananas) that oxidize quickly. Granola Recipe: Preheat oven to 325 degrees F (165 degrees C) and place rack in the center of the oven. Either butter or line a baking sheet with parchment paper. In a small bowl, stir together the oil (or melted butter), and maple syrup. Pour this mixture over the dry ingredients and toss together, making sure all the dry ingredients are coated with the liquid. Spread onto the prepared baking sheet and bake for about 30 - 45 minutes or until golden brown, stirring occasionally so the mixture browns evenly. (The browner the granola gets (without burning) the crunchier the granola will be.) Place on a wire rack to cool. You will notice that the granola may still be sticky when it is removed from the oven but it will become crisp and dry as it cools. Make sure to break up any large clumps of granola while the mixture is still warm. 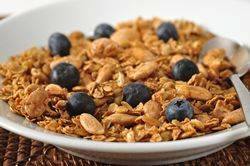 Once the granola has completely cooled, store in an airtight container or plastic bag in the refrigerator. It will keep for several weeks.